It’s not every day that you have the opportunity to meet a true basketball coaching legend. I had that very privilege recently when I shared a meal and time with the tremendous basketball coach and human being, Don Meyer. Coach Meyer is the all-time winningest coach in NCAA men’s basketball history and recently retired as head coach at Northern State University. More impressive than his coaching accomplishments has been the storied journey he’s gone through in battling cancer and a horrific car accident a few years ago. Sportswriter, Buster Olney, recently wrote a book titled, “How Lucky You Can Be: The Story of Coach Don Meyer,” which further illustrates how much he has gone through. During our time together, his humor, humility, and honesty made the evening such an enjoyable time to share together. It comes as no surprise that he’s been so resilient through all of the challenges he’s faced. Coach Meyer shared what was most difficult about not coaching on a daily basis, but also stated how he felt like he was on a ’24-7′ vacation as he now is resorted to speaking at clinics, camps, and to business organizations. Coach said the stress of coaching was something he never realized until he had retired last spring. We spoke of organization and how to create productivity each and every day. He shared how he organized his daily, weekly, and monthly schedule. And, despite all the technology that’s available, he still keeps a piece of paper on him at all times to ensure he’s completed his daily tasks. Most impactful was our conversation about developing positive relationships. He encouraged me to use an ‘eight to 12 touches per day’ rule — both personally and professionally. For instance, as a basketball coach, Coach Meyer’s goal was to give at least eight personal touches to his basketball players each day. I asked him if he spoke to his players about relationships and he poignantly said, “Every lesson on court is a lesson in life”. I know he saw my face light up, and we discussed what this meant further to each of us. 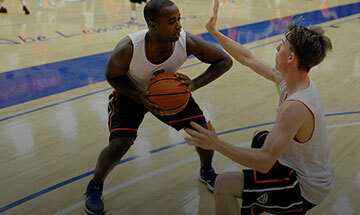 If all we do is teach players how to dribble, pass, and shoot, we are missing out on a tremendous opportunity. The best coaches, like Coach Meyer, constantly find parallels between practice situations or games and tie them to a creative or powerful teaching point that has the ability to not only transform a player’s game, but more importantly, their life. So coaches, always remember the words of Coach Meyer: “Every lesson on court is a lesson in life”. I know I will.